In 1939, the first Major League Baseball game was broadcast on TV—a double-header between the Cincinnati Reds and the Brooklyn Dodgers—at a time when American TV was still very much an experiment. But this broadcast was a long time coming. In fact, years before practical TV tech had even been demonstrated, people were already dreaming about how they’d be able to watch America’s pastime from the comfort of their own homes. 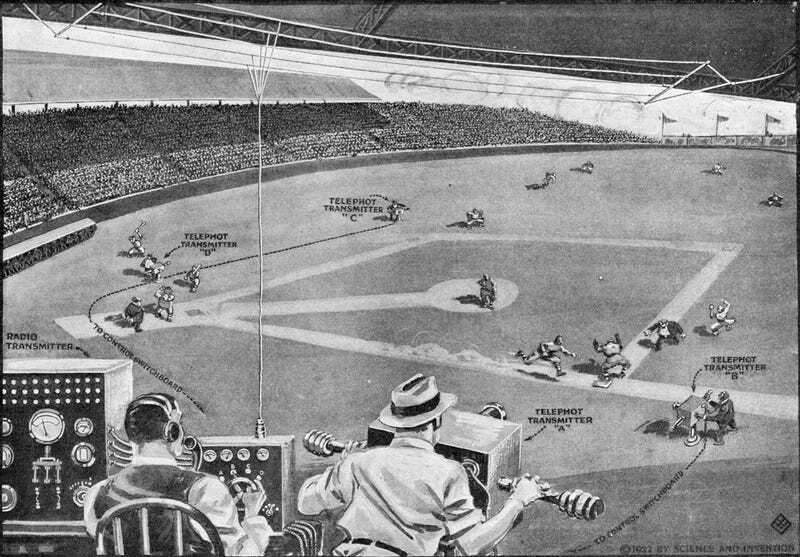 “In this illustration we behold how future audiences will see a baseball game thousands of miles away,” the July 1922 issue of Science and Invention magazine promised. The illustration above was a sci-fi fantasy in 1922. The magazine imagined four cameras (the first televised Major League game had only two) and a person sitting at a control booth switching between camera angles while the signal beamed out to the masses. None of the wireless camera technology pictured above, let alone a TV channel, was available at the time. The most fascinating aspect of all this is that when this illustration was published, even radio wasn’t yet fully established as a broadcast medium. Much like TV, radio had struggled to emerge as media that people viewed as being broadcast (one point to many) rather than simply point-to-point. Radio was slowly getting there, but futuristic visions of TV, of which there were relatively few, still imagined television as something more like videophone technology. But this 1922 look at baseball broadcasting got a lot right. Things that we take for granted in TV production today had to be invented more or less from scratch or borrowed from early cinema and sports newsreels; techniques like cutting from different perspectives, which is much more difficult during a live TV broadcast than edited film. The easiest and most sensible thing to do with longform sports broadcasting was to simply plant a camera that could see the entire field. But live cuts to different perspectives — including the close-up — were understood even this early as essential parts of keeping viewers interested. The operators of the telephot transmitters A, B, C and D “shoot” the interesting parts of the game, but they do not do this simultaneously. They merely point the telephot transmitter into focus while the radio operator at his instrument switches from one to the other in order to get those close-ups which he wishes. The distant audience then will see whatever close-ups are selected by the radio operator. The wireless broadcast of moving pictures even adopted the terminology of its predecessor — they called it television by radio. And much like the behind-the-scenes production details that still had to be worked out, in-home viewing still hadn’t adopted the norms we know today. The front cover of that issue of Science and Invention had plenty of strange and failed ideas about the future of watching baseball at home. Perhaps the most important being that men would wear suits to do it — nary a sweatpant in sight.